ENGINEERED HARDWOOD FLOORING: WHO NEEDS IT? What is Engineered hardwood flooring and when do you need it? Well, after so many people telling me how helpful my blog has been, I’m making a renewed commitment to getting back on the horse! But enough about me…on to the topic at hand! To start, Engineered flooring is real hardwood – not laminate, which looks like wood but is fake. Engineered flooring is made of several core layers of plywood, high density fiberboard, or other type of hardwood glued together and a thin layer, or veneer, of a particular hardwood flooring species glued on top of those layers. This creates a more stable floor. What does that mean? Is hardwood flooring unstable? In general, hardwood flooring is a wonderful choice for long-term enjoyment, but it is an organic substance that responds to its environment. Mainly, the elements in the environment that cause hardwood to move are: moisture, humidity levels, and heat. Yes, wood floors do move throughout their lifetime! If it is very humid, boards can swell, while in very dry/cold conditions, they will shrink up, which leads to what we call seasonal gapping. Going even farther, under very adverse conditions, solid wood floors can warp, cup (edges of the boards turn upwards), swell, or split apart. Because Engineered hardwood flooring is a multi-ply plank of several different layers glued together, as opposed to one solid piece of wood that moves as a whole, it resists twisting and cupping and remains flat and intact. Notice the multiple layers of plywood with the veneer of hardwood on top. This particular piece is Quarter Sawn White Oak. 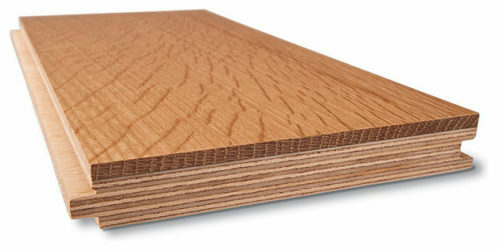 Engineered wood flooring is also available in different species and grades, just like solid hardwoods. There are just as many options with Engineered wood flooring as there are with a solid hardwood floor. Making samples on 6" Character Grade Maple Engineered wood floors in Head of the Harbor, NY. This floor was installed over radiant heating. Finished product is very striking and unique! 6" Character Grade Maple Engineered wood flooring installed over radiant, sanded and finished on site with custom blended Dura Seal stain and 3 coats Bona Traffic HD water based polyurethane. Head of the Harbor, NY. 1) Because of its more stable construction, Engineered flooring can be installed directly over concrete. It does not need a plywood subfloor as solid hardwood flooring does. If you have a concrete subfloor, it can often be less expensive to install engineered flooring because you don’t have to purchase plywood and/or pay for the labor to install it. Also, there are rarely clearance issues to deal with when installing Engineered wood flooring directly onto a concrete slab. Oftentimes, installing a 3/4" plywood subfloor and a 3/4" hardwood floor to a slab formerly carpeted will necessitate that doors be cut and baseboard heating pipes raised to accommodate the 1.5" height increase of the new flooring. Installing Unfinished 4" Select & Better Grade Red Oak Engineered hardwood flooring directly onto concrete slab in Dix Hills, NY. Homeowners did not have to cut any of the doors or raise any baseboards, and we were able to install the flooring at the same height as existing tile, eliminating the need for transitions. Sanded and finished on site with Special Walnut stain and 3 coats Bona Traffic HD water based polyurethane. 2) Engineered flooring is a great choice for below-grade applications, such as basements, which can often be prone to greater swings in humidity and moisture levels. We do not recommend to install solid hardwood in below-grade applications. Installing Unfinished 4" Select Grade White Oak in a basement in Southampton, NY. Notice it looks just like a solid hardwood once installed. 3) People love the trend toward wider planks, but wider planks are more susceptible to dramatic seasonal gapping due to their larger surface area. Gaps drive some people crazy! Because Engineered flooring has a multi-layer plywood core and only a small veneer of hardwood, it is less prone to seasonal gapping. 4) Because of its more stable construction, Engineered flooring can be installed over radiant heating. The only solid hardwood that can be installed over radiant heat is Rift & Quartered material, which is a particular cut of hardwood flooring that I will discuss in a future post. With very wide planks over radiant, we recommend to use Engineered flooring as opposed to a Rift & Quartered solid. Unfinished 8" Select & Better White Oak Engineered flooring being installed over radiant heating in West Islip, NY. Though you can install Rift & Quartered solid flooring over radiant heating as well, we suggest Engineered flooring as the best choice for very wide planking like this. We will be coming back to sand and finish this project soon! So this Engineered hardwood sounds wonderful! Why doesn’t everyone use it all the time? The main drawback to Engineered hardwood is that it has a small layer of actual hardwood on top of the multi-layer plywood core. Why is that a drawback? As hardwood floors show wear over time, one of the great benefits of hardwood flooring is that it can be sanded and refinished and be made to look new again. With its smaller layer of sand-able wood, Engineered flooring is not able to be sanded as many times as a solid floor. However, with its many benefits, many homeowners are choosing to use Engineered flooring. Once installed and finished, it looks identical to a solid, and how often do our customers re-sand their flooring? Maybe every 20 – 25 years on average? If you purchase an Engineered floor with at least a 4mm “wear layer,” the floors should last at minimum 60 years. Beautiful 4" White Oak Engineered wood floor we installed in a basement in Sag Harbor, NY this winter. The floor was unfinished, and we recently sanded and finished it with Woca Driftwood Lye White and Woca Color Oil Extra White hardwax oil. Engineered flooring gives you the opportunity to make your basement flooring look just as high end as the rest of the house! 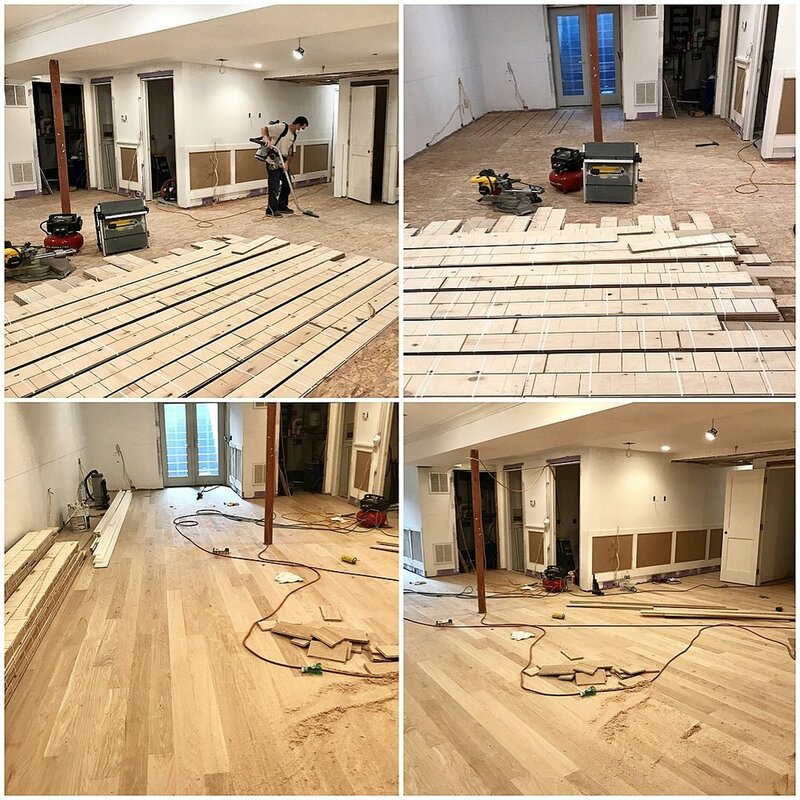 In this particular project, we installed a 4" White Oak solid on the upper 2 floors, and sanded and finished all the floors exactly the same.